First of all, I must say that Bloomberg has done a tremendous job turning around Businessweek. The magazine was completely stale, with short, trite articles in the beginning, and boring, shallow articles in the middle. At the end, the investing tips were worth what I paid for the magazine (about $0.25 per issue). Now, the articles are deep and the content is rich. I had no idea a periodical could be turned around that fast. I plan on re-subscribing. 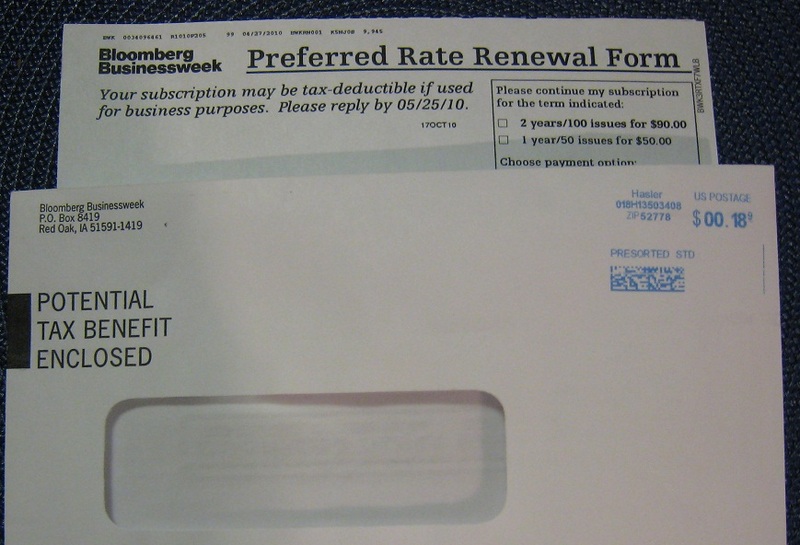 Speaking of which, I got this offer in the mail from Bloomberg Business week. It is brilliant on so many levels. Most importantly, the pitch is terrific. “Potential Tax Benefit Enclosed.” What better way to get a business person to open the envelope. That alone must put it among the most highly opened letters for its demographic. On a deeper level, the pitch resonates with professionals. Why didn’t the old Businessweek ever pitch the magazine this way? It’s a great way to discount the price of the magazine, but at the expense of Uncle Sam. Speaking of discounts, there is none to speak of. You can find this magazine via an online discount site for about $5 for a year’s subscription. Here, they’re asking for $50 – 10X the price. But to a professional, they’re thinking they want to get the tax write-off and this is the only way to get it. So they buy. $0.18 to mail the letter? That’s one of the cheapest prices I’ve ever seen. Credit Card offers usually pay a higher amount. Bloomberg knows how to play the game. All in all, a fantastic piece of direct mail, even without fancy graphics or colored paper. Who will be awarded the 2018 and 2022 World Cups?